Previously, suits were only a man’s wear which was worn during special occasions and for any formal meetings. It was the mark of elite class to wear suits which are made out of the finest raw materials and which reflect style and personality to the fullest. But now, the scene has changed entirely. Now, both men and women can flaunt their style by wearing suits which are available in various colors, shapes, sizes, designs and more. It is not a formal wear anymore. People can easily flaunt their style by wearing such formal apparel at any social function as well like birthday party, a get together, wedding and what not! 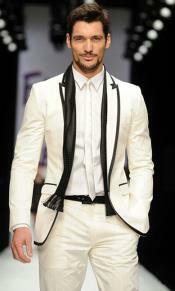 Wearing fitted suits will surely enhance the style statement. Going for the suit tailoring or tailored suits can be the best and reliable option in this regard. As mentioned earlier, suits which are well fitted can help you show your personality and style more. You always need to wear such apparels that will compliment your body curves and physique well. This can only happen if you wear suits that fit perfectly. Only a tailored suit will provide you with quality results that will surely make you the center of attraction among all. This kind of suits will also provide you with the opportunity to take full control of your style and design without anyone intervening in it. It is a known fact that suits are way too expensive when compared with other apparels. Therefore, it is a must to invest in real time tailored apparel that can last for a longer period of time. At first, the buyer needs to choose the fabric of the suit that he wants to make. He must look for the fabric that matches the weather condition of the place. For example, if the wearer stays nearer to tropical region then he must opt for cotton or linen raw materials, which will not only provide style but comfort at the same time. Similarly for those, who stay in America or UK can opt for the woolen raw materials for tailoring their suits. Next, he needs to choose the color of the materials. It must match up with the skin tone of the wearer. The buyer must also see the time of the day when he is planning to wear the tailored suits. During morning time, it is advisable to go for lighter shades like tan, cream, white and more. During night time, darker shades like black and navy blue can be the ideal choice. Look for the design and shape of the suit before tailoring it. It must match up with the physique and the height to provide an aristocratic look. You can also opt for the additional accessories that will help you enhance your look. You must look for the best suit tailoring option at online stores to get quality discounts on the market price.